Heading from the rustic Australian wilderness to the scenic locales of the United States, Train Conductor 2: USA has been officially announced for the iPhone. Developed by The Voxel Agents, creators of the original Train Conductor app, this sequel packs five new levels and an original soundtrack, as well as some fan-friendly competitive content. The game will be available in the App Store on July 17. The Voxel Agents’ CEO Simon Joslin recently invited us to a demo of the game. He reintroduced us to the gameplay and took us on a tour of the five different American-themed levels. Like the first Train Conductor, the gameplay revolves around directing various trains to their appropriately numbered stations. Using the iPhone (or iPad’s) touchscreen, players can use their fingers to link different parallel train tracks together in order to keep traffic moving flawlessly, as well as tapping the trains themselves to stop their engines momentarily. 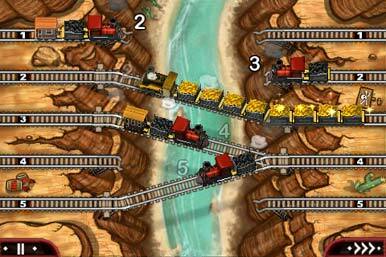 The longer you’re able to keep the train cars from colliding, the higher your score will climb, although the difficulty increases exponentially as time goes by. Unlike the first Train Conductor, where each level followed the same difficulty curve, Train Conductor 2 presents a different challenge in each one of the five cities it visits. Our first stop in the demo was Miami Beach, where an upbeat jazz mix accompanied the palm-tree laden beach locale. Here, Joslin showed us that different types of trains are styled to match the theme of the level. In Miami, brightly colored railcars inch along monorail tracks, with no obstacles to interrupt the flow. Nashville was vastly different, exchanging the rail cars for ghosts that passed harmlessly through each other. Although the lack of collusions stressed more speed than damage control, the number of ghosts eventually overwhelmed the demo team, and then the “skull trains” effectively ended the level went things got too hectic. Missing a few ghosts was no big deal, but the demon trains were another matter. Next, we headed to the New York City Subway level, where the track mapping had a few obstacles thrown into the mix. Being a subway, we had to navigate electric trains around columns while keeping them from crashing into each other. While we didn’t get too far without an accident, the demo team told us that the level would eventually up the ante with people running across the tracks in random patterns. Afterward, we saw another ghost-themed level in Las Vegas, where the soundtrack took a distinct nightclub-like vibe. 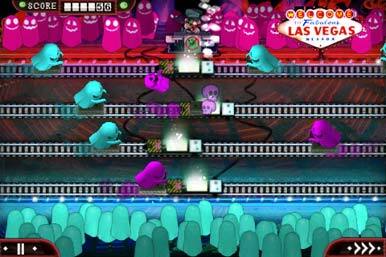 Instead of directing the ghosts to different stations, however, the goal of the level was to send the differently colored (neon blue and bright green) specters to opposite sides of the screen before they got caught in ghost traps lining the center of every railroad track. While it seemed simple at first, the number of ghosts increased until too many got snared within the Ghostbuster-like devices. Our last stop in the demo was the rustic Grand Canyon level, where the titular gorge divided the tracks in middle of the scenery. By tracing a straight line between two broken railroads, we could advance the steam trains to their proper stations. While you do have a little room to breathe since most trains will pause at the edge of the canyon, even more will crowd the tracks if you don’t quickly clear a path. Some complexity here was thrown into the mix with “gold rush” trains (convoys that carried anywhere between one to five cars) and “black trains” that would plunge into the canyon rather than waiting patiently at the edge of the ravine. Along with the new levels and gameplay tweaks, Train Conductor 2 sports a slightly cleaner heads-up display (HUD), shifting the score counters to the far corners of the screen, giving the hand-drawn artwork a bit more real estate. Aside from the refreshed visuals, the music, composed by Simon’s brother, Joel Joslin, really stood out in the demo. Each level has a distinctly unique sound that helps to accentuate the differing styles of the various cities. The Voxel Agents also hinted that depending on sales of Train Conductor 2 (which will be $1 at the App Store), the soundtrack for both games in the series might be headed towards a free downloadable release. Once the game is released, Train Conductor 2 will support social networking via Twitter and Facebook, allowing players to post their scores online and take home bragging rights for their high scores. The game is ready for the iPhone 4, and after the initial launch, The Voxel Agents will continue to update the game with new features, such as leaderboards and in-game achievements. If you’re looking forward to the release, the first Train Conductor game is still available for $2 in the App Store, just in case you want to brush up on your time-management skills. iPad users don’t need to worry about missing out, as Simon Joel confirms that his team is currently hard at work on getting a version for the game ready for Apple’s tablet.